A stylish modern girl entered Kaali’s house.She went straight to him.Kaali stared at her. That girl is none other than Gauri. Gauri:Why are you ringing up continuously and disturbing me? 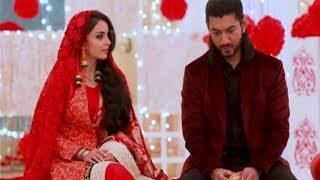 Kaali:It seems that you have really fallen for Omkara Singh Oberoi and intends to be a good bahu to Oberois.I was calling you to remind you of your mission.Don’t forget that you are only a con girl and we planned this drama only to get into Oberoi Mansion and loot them. Gauri:Stop it Mr.Kaali Thakur.You don’t have to remind me of anything.I know my job very well and till now I have been successful because of my sincerity.I pretended to be a poor girl who has been forced to elope to escape from marrying a cruel Don like you.The innocent Omkara and the foolish Oberois believed it and gave me a place in their house when I pretended to be a poor victim and a sick weak girl.Very soon I won their trust and love to the extent that they decided to get me married to their son Omkara. 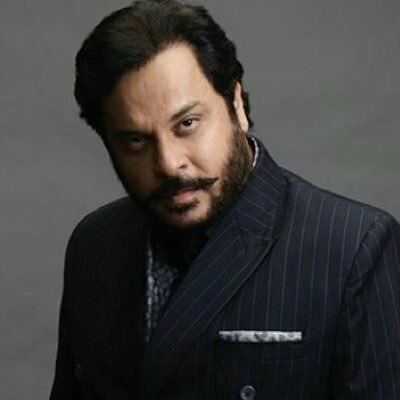 The only obstacles were Tej Singh Oberoi and Pinky Singh Oberoi.Now that route is also clear.They too believe me now.Poor Tej too could’nt find out my real intention as I never left any proof to doubt that I am a con girl.That funny foolish Oberoi Rudra doubted how I am strong like a police woman.He does’t know that I am a con girl who has fought strongly with many strong people.That Omkara is blindly in love with me.He can even bring the world’s whole wealth for me.So don’t call me unnecessarily and create doubts in their minds about us.I don’t want them to doubt me because of your stupid phone calls.If so our whole effort will get wasted ad and our well planned game will get spoiled. Kaali:Ok.But make sure that you will not fall in love with that Omkara while doing love drama with him. Gauri was reminded of the romantic moment she shared with Om and got emotional. Gauri:I will not betray you.Stop doubting me. Kaali:Ok.Come here on your wedding day to execute our next plan. They did not know that two secret eyes were watching them. Omkara and Gauri dressed up grandly for the engagement function. Suddenly Gauri saw her name’s tattoo on his arm. Gauri:Omkaraji…why my name is written over your arm.It’s permanent tattoo.Right? Om:Ya..it’s a permanent tattoo.You are my life Gauri.So I did your name’s tattoo on my arm. Gauri:But it’s painful.Right?Then why did you do it? Om:That pain was nothing.I felt happy when I wrote your name on my arm.Now you will be there on my body forever. Gauri looked at him emotionally. She thought:For me Omkaraji bore so much of pain.But I am going to give him the biggest pain. Om:I am happy that you will be with me all through out my life.Life without you is impossible Gauri.I love you that much. His words pricked Gauri’s heart. She thought:He loves me so much and I am betraying him mercilessly.Am I so cruel to break his innocent heart into pieces? Om:Living with you is more than enough for me. She thought:No one can love me more than Omkaraji.He trusts me blindly.He is hurting himself for me.But what am I doing?I am betraying him and breaking his heart ito pieces. Unknowingly Gauri’s eyes became wet. Tujhko Main Kar Loon Hasil Lagi Hai Yahi Dhun. Tujhko Main Kar Loo Hasil Lagi Hai Yahi Dhun(TUM MILE). Rudra and Soumya came on stage. Rudra:This is for you both Om and Gauri bhabhi. Rudra and Soumya danced looking at Om Gauri. Shivay:Now comes the stars of the evening.My dear brother Omkara and his would be wife my sister Gauri. 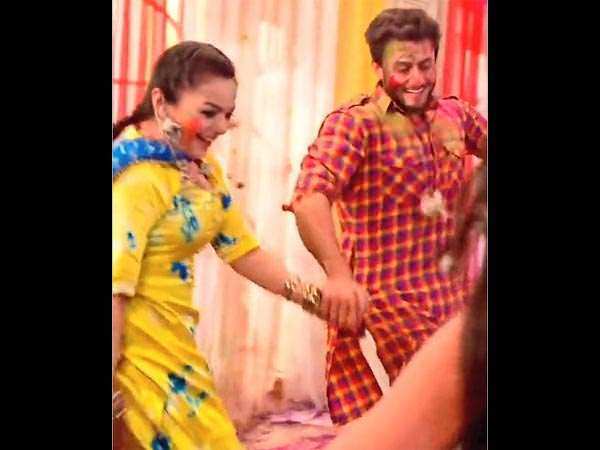 Om and Gauri blushed.Aika pushed them to the dance floor. Om looked at her passionately,Gauri raised her eye brows and looked at Om romantically. All the elders were enjoying the party too.The PI Abhishek rang up Tej during the party. Because of the loud music Tej was not able to hear anything.So he went out to attend the call. Tej:Yes Abhishek..tell me.What’s the matter? Abhishek:Sir…I want to meet you urgently. Tej:Ok.I will meet you soon.But right now I am at the engagement party.After the party I will meet you. After the party Tej went to meet Abhishek. Abhishek:Sir…your doubt about Gauri is right.She is a gold digger.She is a con girl who works with the Don Kaali Thakur .Purposefully she played the drama of being a victim to Kaali Thakur’s tortures to get into Oberoi Mansion to get what they want.Their eyes are on Oberoi properties. Tej was shocked.She remembered the good deeds which Gauri did for them. Abhishek:Sir..till now you had no faith in her.now suddenly why you are finding it difficult to believe that Gauri is a fraud? Tej:Because Gauri did a lot of good things for our family. Abhishek:It’s all her drama Sir. Tej:Damn it!Now you are telling this?Could’nt you say this before the engagement?I told you many times to enquire about her properly. Abhishek:Sorry Sir.Actually Gauri and Kaaii Thakur are so cunning that they covered up all their fraud games. Still I had an eye on Gauri.That’s how I found her meeting Kaali secretly.They did’nt know that I was stalking them.Their next meeting is fixed on the wedding day. Tej:Wedding day?Ok.Let the wedding day come.Let her go and meet that evil Kaali.I will catch her red handed and expose them to the world.Till then dream about snatching our wealth and having a luxurious life Gauri and Kaali. oh no gauri is a con girl..mind blowing twist.. will be waiting for the next..